Your bathroom suite is the foundation upon which the rest of your bathroom is built. In this article, we’ll be looking at some of the latest bathroom suites ideas for 2019, showing you what’s new and what to look out for in the world of bathrooms. Usually the first thing you consider when buying for your bathroom, bathroom suites provide both function and stylistic direction to the rest of your design. There certainly isn’t a one-size-fits all approach to designing bathroom suites, with a whole variety of different needs catered for. From accessible bathrooms for Independent Living, to busy family bathrooms, bathroom suites come in all shapes and sizes to suit. It might not necessarily be your master bathroom which requires a new suite. Ensuite bathroom suites and cloakroom suites are equally as important when refurbishing your whole home. 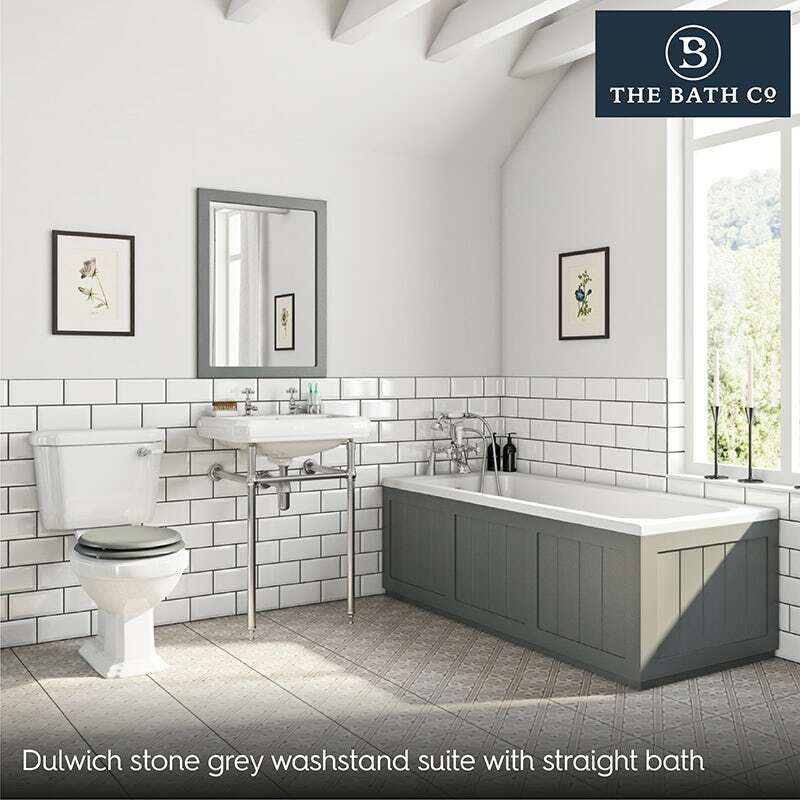 No matter what your requirements are, we have come up with our 5 top bathroom suite ideas for 2019. With the average UK home the smallest it’s been since records began, lack of space is a major issue for many people. How we use that space is key to making our homes, and more specifically, our bathrooms inviting places to spend time in. Our bathroom designers and stylists have been working overtime on this thorny issue and have come up with some fabulous bathroom suites ideas which can help you optimise space, no matter how small your bathroom may be or how awkward the layout. 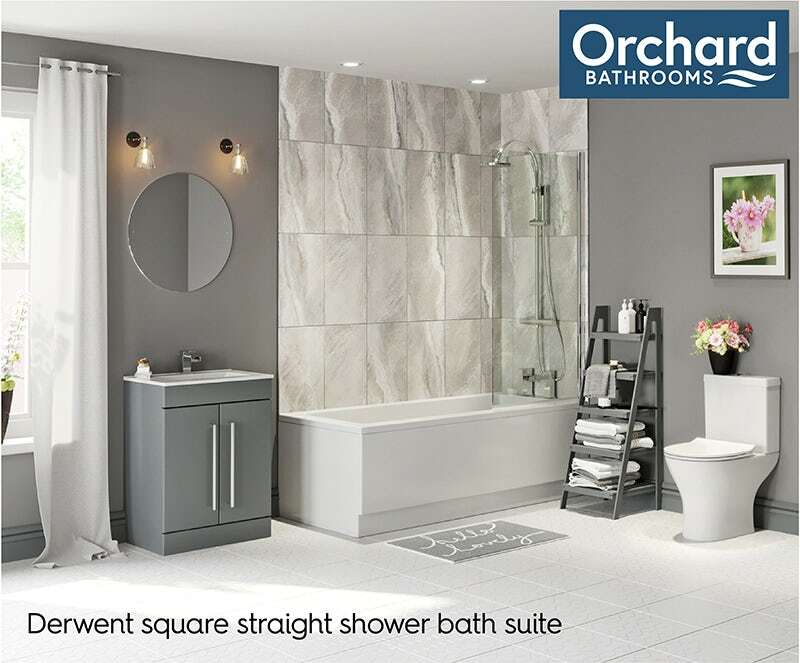 Designed to cope with all the demands that a busy family home can bring, the fabulous Derwent suite from Orchard Bathrooms makes great use of space. From the multi-function shower bath with glass screen to the stylish short projection toilet, you can fit each and every element neatly into a compact space. However, it’s not all about function. The vanity unit comes with an on-trend matt grey finish, whilst the toilet features a slimline soft close seat for a minimalist appearance. To keep costs down, why not simply tile around the splash zones and paint the rest of your walls? Add some simple accessories like some ladder shelves and a soft bath mat for the perfect finishing touches. Traditional bathrooms, with their timeless design and classic touches, remain incredibly popular. With modern materials and manufacturing processes, you can easily achieve the look for less. Instead of the more common pedestal basin, this luxury bathroom suite includes a beautiful washstand. With adjustable legs and a sparkling chrome finish, it is a great choice and also boasts an integrated rail for towels. Separate hot and cold pillar taps with cross head handles add authenticity to the overall design. Adding a vintage-inspired accent colour is easy. In the bathroom below, we used grey, although ivory and sage are also popular traditional colours. The shade is picked out in the decorative wood bath panels, wood toilet seat and the mirror frame. Metro tiles work perfectly with turn of the century style and you could experiment with different colour grouts to enhance the effect. Meanwhile, feature tiles, which were popular in Victorian bathrooms, draw the eye across the floor. Sleek, contemporary styling is all the rage and we’re sure it will be much sought after in 2019. Some of the best bathroom furniture ideas have been taken from the latest trends with a minimalist approach to design. Perfect for a designer look and feel, the Heath furniture range is made from moisture-resistant engineered with a gorgeous woodgrain finish in a choice of either white or oak colouring. The real talking point about this range is the vanity unit which incorporates a motion-sensor LED bulb, so you can search for those essential items in low light. It is also ideal for shared bathrooms thanks to the availability of double basin units, whilst “handleless” drawers present a sleek and minimalist façade. 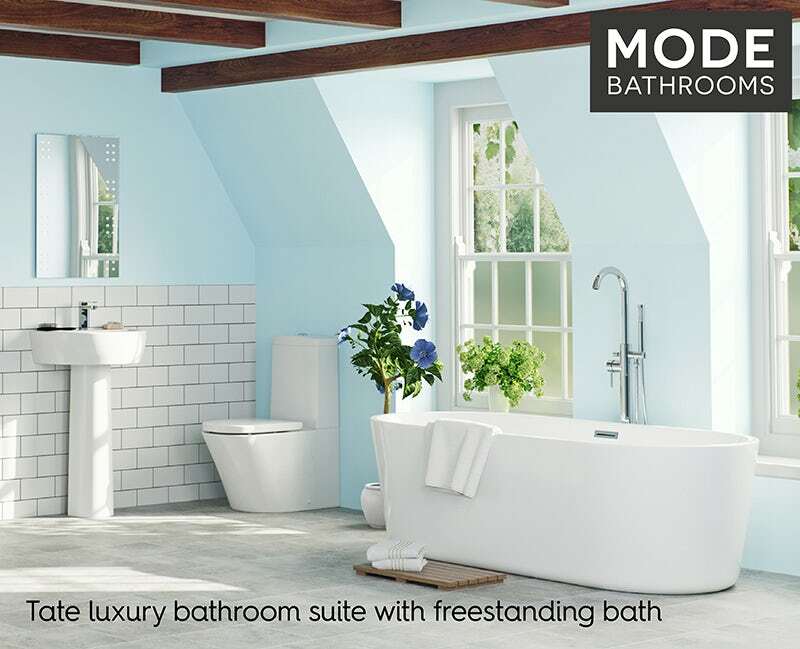 If you’re looking for something with a little bit more luxury in 2019 but don’t want to pay the designer price tags, it’s not too difficult to find a great contemporary bathroom suite at a great price—especially if you take a look at Mode Bathrooms. Clean lines and generous curves make this a designer bathroom suite to be proud of. The gorgeous freestanding bath is simple yet luxurious, making it the perfect place to while away those hours with some bubbles and, maybe, a glass or two of bubbly. Meanwhile, the close coupled toilet with its fully shrouded design and the sleek basin complete the designer look. Pair with an elegant freestanding bath shower mixer tap, plus an LED mirror for added illumination, right where you need it most. Blue is a popular choice for bathroom interiors, and this duck egg blue works perfectly with the white metro tiles. Aside from your living room or dining room, your downstairs cloakroom is one of the only places in your home that guests will visit. With that in mind, your smallest room should really be dressed to impress. 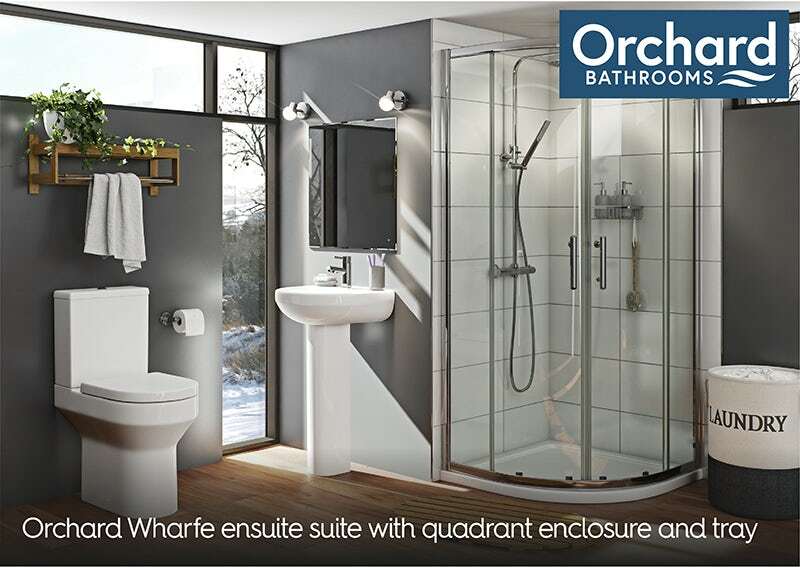 If you like something that’s a little more angular in shape, this cloakroom suite from Orchard Bathrooms is just the job. The beautiful combination of geometric shapes and subtle curves make the Wye suite a great choice for modern cloakrooms in 2019. 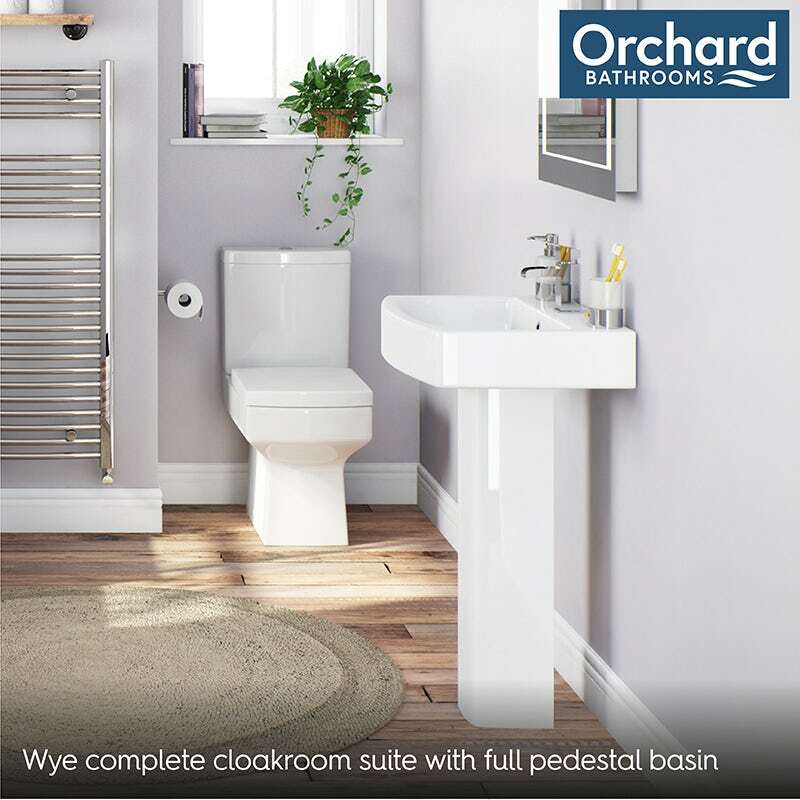 Made from high quality, easy-to-clean glazed ceramic, both the pedestal basin and close coupled toilet make the perfect pairing, ideal for a small space. Plus, with a stylish cloakroom basin mixer and pop up waste included, you won’t need anything else. Got your eye on a certain tap from your favourite brand? In 2019, we’re stocking an increasing range of bathroom suites which include taps and showers from brands like Bristan, Grohe, Mira Showers and more. Take this stylish, contemporary cloakroom suite, for example. Not only does it give you plenty of storage space with the Eden white vanity unit and basin, not to mention a toilet that saves on both water and space, we’ve also included the sleek and stylish Bristan Orta basin mixer tap from the UK’s biggest tap company. 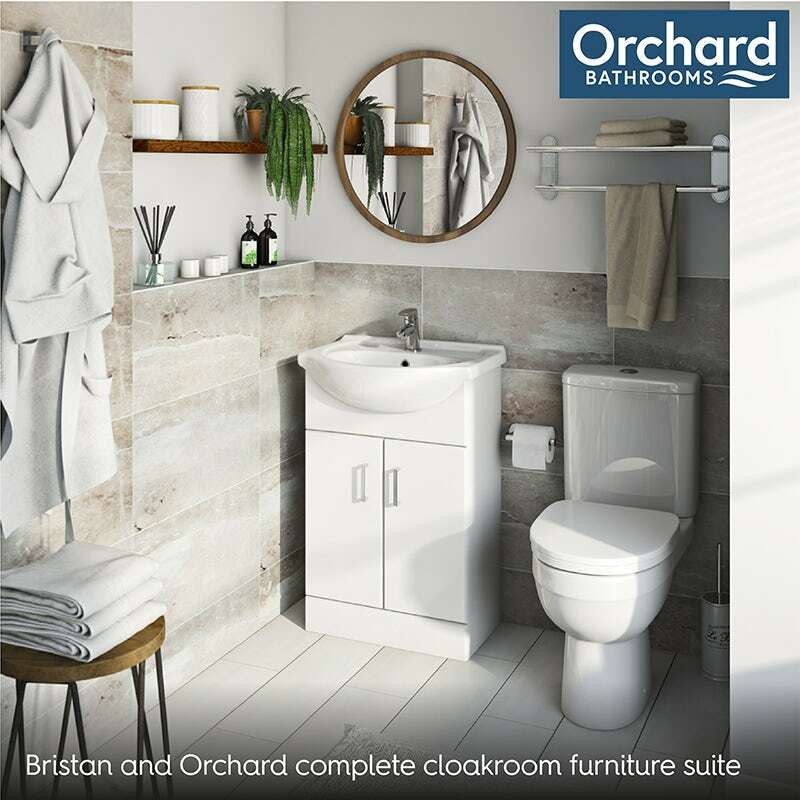 Complete with a pop up waste, this gorgeous cloakroom suite is a great way to reduce clutter and make optimum use of your small space. Searching for more great bathroom inspiration? Check out our bathroom ideas for 2019 for the latest in upcoming trends. We've also got some inspired bathroom furniture ideas for 2019, which will help keep your bathroom clutter-free. If you enjoyed our bathroom suite ideas for 2019, why not browse our full range of bathroom suites? All our bathroom suites are made to the highest of standards, so you can get the look you like at a price you’ll love.